listen, false teaching will always cry intolerance. It will always say you are being divisive, you are being unloving, you are being ungracious, because it can only survive when it doesn’t get scrutinized. So it cries against any intolerance. It cries against any examination, any scrutiny—just let’s embrace each other; let’s love each other; let’s put all that behind us. Now you have the proper background before you read A Covenant For Civility from a group which contains among not a few outright heretics—such as Emerging Church guru Brian McLaren—who’re busy trying to hijack the Christian faith. Christ’s atonement is mocked and rejected, the words of Jesus Christ trampled upon, a literal hell that our Savior warned about is scorned, Holy Scripture is twisted and distorted beyond all recognition, but Jim Wallis and Brian McLaren are out making statements of “Peace, peace!” when there is no peace. (Jeremiah 6:14) When the enemies of God blaspheme His holy name under the banner of a “new kind of Christianity”, they are declaring war, not peace. 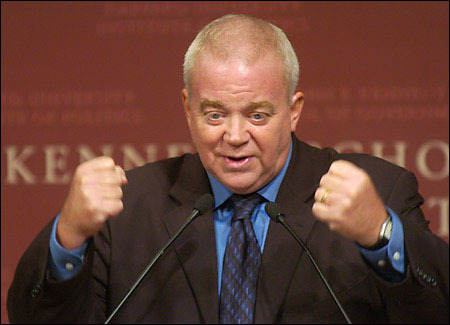 And Jim Wallis, I want make sure you undertsand something very clearly. Just so you know; you’re never going to have your phony unity before the world as long as Christian men like me are still breathing.